Use our handy search tool! This is a dip strip drug test that detects 5 different drugs at one time, a 5 panel drug test (5 drug assay). We also offer a wide range of multi panel drug tests that will test from 2 to 12 drugs. This is a dip strip drug test that detects one drug at a time, a single panel drug test (1 drug assay). Here, we show a cannabis drug test to test for marijuana (THC drug testing). 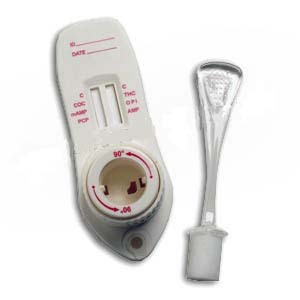 Above is a mouth swab drug test, sometimes referred to as the "Spit Drug Test". The OrAlert drug test detects 6 different drugs at one time (6 drug assay). This is an integrated drug cup. Here, the drug test is integrated or built into the cup. This is an Easy To Use - Easy To Read drug test! Lysergic acid diethylamide, abbreviated LSD or LSD-25, also known as lysergide and colloquially as acid, is a semisynthetic psychedelic drug of the ergoline family, well known for its psychological effects which can include altered thinking processes, closed and open eye visuals, synaesthesia, an altered sense of time and spiritual experiences, as well as for its key role in 1960s counterculture. It is used mainly as an entheogen, recreational drug, and as an agent in psychedelic therapy. LSD is non-addictive, is not known to cause brain damage, and has extremely low toxicity relative to dose, although in rare cases adverse psychiatric reactions such as anxiety or delusions are possible. LSD was first synthesized by Albert Hofmann in 1938 from ergotamine, a chemical derived by Arthur Stoll from ergot, a grain fungus that typically grows on rye. The short form "LSD" comes from its early code name LSD-25, which is an abbreviation for the German "Lysergic acid diethylamide" followed by a sequential number. LSD is sensitive to oxygen, ultraviolet light, and chlorine, especially in solution, though its potency may last for years if it is stored away from light and moisture at low temperature. In pure form it is a colorless, odorless, and mildly bitter solid. 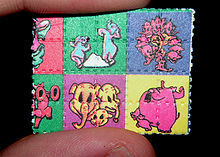 LSD is typically delivered orally, usually on a substrate such as absorbent blotter paper, a sugar cube, or gelatin. In its liquid form, it can also be administered by intramuscular or intravenous injection. LSD is very potent, with 20-30 mg (micrograms) being the threshold dose. Introduced by Sandoz Laboratories, with trade-name Delysid, as a drug with various psychiatric uses in 1947, LSD quickly became a therapeutic agent that appeared to show great promise. In the 1950s the CIA thought it might be applicable to mind control and chemical warfare; the agency's MKULTRA research program propagated the drug among young servicemen and students. The subsequent recreational use of the drug by youth culture in the Western world during the 1960s led to a political firestorm that resulted in its prohibition. Currently, a number of organizations (including the Beckley Foundation, MAPS, Heffter Research Institute and the Albert Hofmann Foundation) exist to fund, encourage and coordinate research into the medicinal and spiritual uses of LSD and related psychedelics. LSD can cause pupil dilation, reduced appetite (for some, it increases), and wakefulness. Other physical reactions to LSD are highly variable and nonspecific, and some of these reactions may be secondary to the psychological effects of LSD. The following symptoms have been reported: numbness, weakness, nausea, hypothermia or hyperthermia (decreased or increased body temperature), elevated blood sugar, goose bumps, increase in heart rate, jaw clenching, perspiration, saliva production, mucus production, sleeplessness, hyperreflexia, and tremors. Some users, including Albert Hofmann, report a strong metallic taste for the duration of the effects. LSD is not considered addictive by the medical community. Rapid tolerance build-up prevents regular use, and there is cross-tolerance shown between LSD, mescaline and psilocybin. This tolerance diminishes after a few days without use and is probably caused by downregulation of 5-HT2A receptors in the brain. LSD's psychological effects (colloquially called a "trip") vary greatly from person to person, depending on factors such as previous experiences, state of mind and environment, as well as dose strength. They also vary from one trip to another, and even as time passes during a single trip. An LSD trip can have long-term psychoemotional effects; some users cite the LSD experience as causing significant changes in their personality and life perspective. Widely different effects emerge based on what Timothy Leary called set and setting; the "set" being the general mindset of the user, and the "setting" being the physical and social environment in which the drug's effects are experienced. Some psychological effects may include an experience of radiant colors, objects and surfaces appearing to ripple or "breathe", colored patterns behind the closed eyelids (eidetic imagery), an altered sense of time (time seems to be stretching, repeating itself, changing speed or stopping), crawling geometric patterns overlaying walls and other objects, morphing objects, a sense that one's thoughts are spiraling into themselves, loss of a sense of identity or the ego (known as "ego death"), and other powerful psycho-physical reactions. Many users experience a dissolution between themselves and the "outside world". This unitive quality may play a role in the spiritual and religious aspects of LSD. The drug sometimes leads to disintegration or restructuring of the user's historical personality and creates a mental state that some users report allows them to have more choice regarding the nature of their own personality. If the user is in a hostile or otherwise unsettling environment, or is nt mentally prepared for the powerful distortions in perception and thought that the drug causes, effects are more likely to be unpleasant than if he or she is in a comfortable environment and has a relaxed, balanced and open mindset. LSD causes expansion and an altered experience of senses, emotions, memories, time, and awareness for 6 to 14 hours, depending on dosage and tolerance. Generally beginning within thirty to ninety minutes after ingestion, the user may experience anything from subtle changes in perception to overwhelming cognitive shifts. Changes in auditory and visual perception are typical. Visual effects include the illusion of movement of static surfaces ("walls breathing"), after image-like trails of moving objects ("tracers"), the appearance of moving colored geometric patterns (especially with closed eyes), an intensification of colors and brightness ("sparkling"), new textures on objects, blurred vision, and shape suggestibility. Users commonly report that the inanimate world appears to animate in an unexplainable way; for instance, objects that are static in three dimensions can seem to be moving relative to one or more additional spatial dimensions. Many of the basic visual effects resemble the phosphenes seen after applying pressure to the eye and have also been studied under the name "form constants". The auditory effects of LSD may include echo-like distortions of sounds, changes in ability to discern concurrent auditory stimuli, and a general intensification of the experience of music. Higher doses often cause intense and fundamental distortions of sensory perception such as synaesthesia, the experience of additional spatial or temporal dimensions, and temporary dissociation. LSD has been used in psychiatry for its perceived therapeutic value, in the treatment of alcoholism, pain and cluster headache relief, for spiritual purposes, and to enhance creativity. However, government organizations like the United States Drug Enforcement Administration maintain that LSD "produces no aphrodisiac effects, does not increase creativity, has no lasting positive effect in treating alcoholics or criminals, does not produce a 'model psychosis', and does not generate immediate personality change." In the 1950s and 1960s LSD was used in psychiatry to enhance psychotherapy. Some psychiatrists believed LSD was especially useful at helping patients to "unblock" repressed subconscious material through other psychotherapeutic methods, and also for treating alcoholism. One study concluded, "The root of the therapeutic value of the LSD experience is its potential for producing self-acceptance and self-surrender," presumably by forcing the user to face issues and problems in that individual's psyche. In December 1968, a survey was made of all 74 UK doctors who had used LSD in humans; 73 replied, 1 had moved overseas and was unavailable. Of the 73 replies, the majority of UK doctors with clinical experience with LSD felt that LSD was effective and had acceptable safety: 41 (56%) continued with clinical use of LSD, 11 (15%) had stopped because of retirement or other extraneous reasons, 9 (12%) had stopped because they found LSD ineffective, and 5 (7%) had stopped because they felt LSD was too dangerous. From 2008-2011 there has been ongoing research in Switzerland into using LSD to alleviate anxiety for terminally ill cancer patients coping with their impending deaths. Preliminary results from the study are promising, and no negative effects have been reported. Some studies in the 1950s that used LSD to treat alcoholism professed a 50% success rate, five times higher than estimates near 10% for Alcoholics Anonymous. A 1998 review was inconclusive. LSD was studied in the 1960s by Eric Kast as an analgesic for serious and chronic pain caused by cancer or other major trauma. Even at low (sub-psychedelic) dosages, it was found to be at least as effective as traditional opiates, while being much longer lasting in pain reduction (lasting as long as a week after peak effects had subsided). Kast attributed this effect to a decrease in anxiety; that is to say they were not experiencing less pain, but rather being less distressed by pain. This reported effect is being tested (though not using LSD) in an ongoing (as of 2006) study of the effects of the psychedelic tryptamine psilocybin on anxiety in terminal cancer patients. LSD has been used as a treatment for cluster headaches, an uncommon but extremely painful disorder. Researcher Peter Goadsby describes the headaches as "worse than natural childbirth or even amputation without anesthetic." Although the phenomenon has not been formally investigated, case reports indicate that LSD and psilocybin can reduce cluster pain and also interrupt the cluster-headache cycle, preventing future headaches from occurring. Currently existing treatments include various ergolines, among other chemicals, so LSD's efficacy may not be surprising. A dose-response study testing the effectiveness of both LSD and psilocybin was planned at McLean Hospital, although the current status of this project is unclear. A 2006 study by McLean researchers interviewed 53 cluster-headache sufferers who treated themselves with either LSD or psilocybin, finding that a majority of the users of either drug reported beneficial effects. Unlike use of LSD or MDMA in psychotherapy, this research involves non-psychological effects and often sub-psychedelic dosages. LSD is considered an entheogen because it can catalyze intense spiritual experiences, during which users may feel they have come into contact with a greater spiritual or cosmic order. Users claim to experience lucid sensations where they have "out of body" experiences. Some users report insights into the way the mind works, and some experience permanent shifts in their life perspective. LSD also allows users to view their life from an introspected point of view. From this point of view, a user can travel back in time to a specific moment or memory and relive that moment again. Some users report using introspection to resolve unresolved or negative feelings towards an individual or incident that occurred in the past. Some users consider LSD a religious sacrament, or a powerful tool for access to the divine. Stanislav Grof has written that religious and mystical experiences observed during LSD sessions appear to be phenomenologically indistinguishable from similar descriptions in the sacred scriptures of the great religions of the world and the secret mystical texts of ancient civilizations. In the 1950s and 1960s, psychiatrists like Oscar Janiger explored the potential effect of LSD on creativity. Experimental studies attempted to measure the effect of LSD on creative activity and aesthetic appreciation. Seventy professional artists were asked to draw two pictures of a Hopi Indian kachina doll, one before ingesting LSD and one after. Although there have been no documented human deaths from an LSD overdose, LSD may temporarily impair the ability to make sensible judgments and understand common dangers, thus making the user more susceptible to accidents and personal injury. It may cause temporary confusion, difficulty with abstract thinking, or signs of impaired memory and attention span that would be consistent with brain damage. However, LSD is physiologically well tolerated and there is no evidence for long-lasting physiological effects on the brain or other parts of the human organism. There is some indication that LSD may trigger a dissociative fugue state in individuals who are taking certain classes of antidepressants such as lithium salts and tricyclics. In such a state, the user has an impulse to wander, and may not be aware of his or her actions, which can lead to physical injury. Anonymous anecdotal reports have attributed seizures and one death to the combination of LSD with lithium. SSRIs noticeably reduce LSD's subjective effects. MAOIs are also reported to reduce the effects of LSD. LSD may trigger panic attacks or feelings of extreme anxiety, colloquially referred to as a "bad trip". While publicly available documents indicate that the CIA and Department Of Defense have discontinued research into the use of LSD as a means of mind control, research from the 1960s suggests there exists evidence that both mentally ill and healthy people are more suggestible while under its influence. There are some cases of LSD inducing a psychosis in people who appeared to be healthy before taking LSD. In most cases, the psychosis-like reaction is of short duration, but in other cases it may be chronic. It is difficult to determine whether LSD itself induces these reactions or if it triggers latent conditions that would have manifested themselves otherwise. The similarities of time course and outcomes between putatively LSD-precipitated and other psychoses suggest that the two types of syndromes are not different and that LSD may have been a nonspecific trigger. Cohen (1960) estimated 0.8 per 1,000 volunteers (the single case among approximately 1250 study volunteers was the identical twin of a schizophrenic and he recovered within 5 days) and 1.8 per 1,000 psychiatric patients (7 cases among approximately 3850 patients, of which 2 cases were "preschizophrenic" or had previous hallucinatory experience, 1 case had unknown outcome, 1 case had incomplete recovery, and 5 cases recovered within up to 6 months). Malleson (1971) reported no cases of psychosis among experimental subjects (170 volunteers who received a total of 450 LSD sessions) and estimated 9 per 1,000 among psychiatric patients (37 cases among 4300 patients, of which 8 details are unknown, 10 appeared chronic, and 19 recovered completely within up to 3 months). However, in neither survey study was it possible to compare the rate of lasting psychosis in these volunteers and patients receiving LSD with the rate of psychosis found in other groups of research volunteers or in other methods of psychiatric treatment (for example, those receiving placebo). "The hallucinogenic experience is so striking that many subsequent disturbances may be attributed to it without further justification. The highly suggestible or hysterical individual would tend to focus on his LSD experience to explain subsequent illness. Patients have complained to Abramson that their LSD exposure produced migraine headaches and attacks of influenza up to a year later. One Chinese girl became paraplegic and ascribed that catastrophe to LSD. It so happened that these people were all in the control group and had received nothing but tap water." "Flashbacks" are a reported psychological phenomenon in which an individual experiences an episode of some of LSD's subjective effects long after the drug has worn off, usually in the days after typical doses. In some rarer cases, flashbacks have lasted longer, but are generally short-lived and mild compared to the actual LSD "trip". Flashbacks can incorporate both positive and negative aspects of LSD trips, and are typically elicited by triggers such as alcohol or cannabis use, stress, caffeine, or sleepiness. Flashbacks have proven difficult to study and are no longer officially recognized as a psychiatric syndrome. However, colloquial usage of the term persists and usually refers to any drug-free experience reminiscent of psychedelic drug effects, with the typical connotation that the episodes are of short duration. No definitive explanation is currently available for these experiences. Any attempt at explanation must reflect several observations: first, over 70 percent of LSD users claim never to have "flashed back"; second, the phenomenon does appear linked with LSD use, though a causal connection has not been established; and third, a higher proportion of psychiatric patients report flashbacks than other users. Several studies have tried to determine how likely a user of LSD, not suffering from known psychiatric conditions, is to experience flashbacks. The larger studies include Blumenfeld's in 1971 and Naditch and Fenwick's in 1977, which arrived at figures of 20% and 28%, respectively. Although flashbacks themselves are not recognized as a medical syndrome, there is a recognized syndrome called Hallucinogen Persisting Perception Disorder (HPPD) in which LSD-like visual changes are not temporary and brief, as they are in flash-backs, but instead are persistent, and cause clinically significant impairment or distress. The syndrome is a DSM-IV diagnosis. Several scientific journal articles have described the disorder. HPPD differs from flashbacks in that it is persistent and apparently entirely visual (although mood and anxiety disorders are sometimes diagnosed in the same individuals). A recent review suggests that HPPD (as defined in the DSM-IV) is rare and affects only a distinctly vulnerable subpopulation of users. However, it is possible that the prevalence of HPPD is underestimated because most of the diagnoses are applied to people who are willing to admit to their health care practitioner that they have previously used psychotropics, and presumably many people are reluctant to admit this. There is no consensus regarding the nature and causes of HPPD (or flashbacks). A study of 44 HPPD subjects who had previously ingested LSD showed EEG abnormalities. Given that some symptoms have environmental triggers, it may represent a failure to adjust visual processing to changing environmental conditions. There are no explanations for why only some individuals develop HPPD. Explanations in terms of LSD physically remaining in the body for months or years after consumption have been discounted by experimental evidence. Some say HPPD is a manifestation of post-traumatic stress disorder, not related to the direct action of LSD on brain chemistry, and varies according to the susceptibility of the individual to the disorder. Many emotionally intense experiences can lead to flashbacks when a person is reminded acutely of the original experience. However, not all published case reports of HPPD appear to describe an anxious hyper-vigilant state reminiscent of post-traumatic stress disorder. Instead, some cases appear to involve only visual symptoms. Early pharmacological testing by Sandoz in laboratory animals showed that LSD can stimulate uterine contractions, with efficacy comparable to ergobasine, the active uterotonic component of the ergot fungus. (Hofmann's work on ergot derivatives also produced a modified form of ergobasine which became a widely accepted medication used in obstetrics, under the trade name Methergine.) Therefore, LSD use by pregnant women could be dangerous and is contraindicated. However, the relevance of these animal studies to humans is unclear, and a 2008 medical reference guide to drugs in pregnancy and lactation stated, "It appears unlikely that pure LSD administered in a controlled condition is an abortifacient." Beginning in 1967, studies raised concerns that LSD might produce genetic damage or developmental abnormalities in fetuses. However, these initial reports were based on in vitro studies or were poorly controlled and have not been substantiated. In studies of chromosomal changes in human users and in monkeys, the balance of evidence suggests no increase in chromosomal damage. For example, white blood cells of people who had been given LSD in a clinical setting were examined for visible chromosomal abnormalities; overall, there appeared to be no lasting changes. Several studies have been conducted using illicit LSD users and provide a less clear picture. 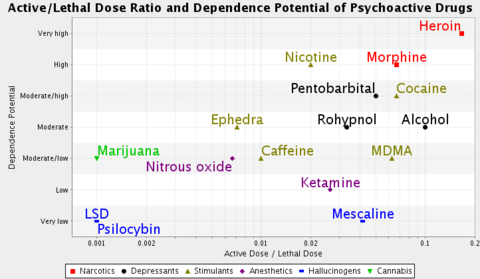 Interpretation of these data is generally complicated by factors such as the unknown chemical composition of street LSD, concurrent use of other psychoactive drugs, and diseases such as hepatitis in the sampled populations. It seems possible the small number of genetic abnormalities reported in users of street LSD is either coincidental or related to factors other than a toxic effect of pure LSD. A 2008 medical review concluded, "The available data suggest that pure LSD does not cause chromosomal abnormalities, spontaneous abortions, or congenital malformations." Adverse effects of psychotropics are often treated with fast-acting benzodiazepines like diazepam or triazolam that have calming and antianxiety effects but do not directly affect the specific actions of psychotropics. Theoretically, specific 5-HT2A receptor antagonists, which most commonly means atypical antipsychotics (quetiapine, olanzapine, risperidone, etc.) or other 5-HT2A antagonist such as trazodone or mirtazapine, would be direct antidotes, although some anecdotal reports claim otherwise. Also, some people have reported that taking an SSRI such as fluoxetine will counteract the effects of LSD. Some reports indicate that although administration of chlorpromazine (Thorazine) or similar typical antipsychotic tranquilizers will not end an LSD trip, it will either lessen the intensity or immobilize and numb the patient, a side effect of the medication. While it also may not end an LSD trip, the best chemical treatment for a "bad trip" is an anxiolytic agent such as diazepam (Valium) or another benzodiazepine. As the effect of the drug is psychological as well as physical, any treatment should focus on calming the patient. Limiting stimuli such as bright lights and loud noises can help in the event of an ill reaction. Many rumors about home remedies to counteract psychedelic effects are circulated, including vanilla essence, and anti-histamines. These may have a placebo effect, working by making the taker think they have done something to make it better. LSD is an ergoline derivative. It is commonly synthesised by reacting diethylamine with an activated form of lysergic acid. Activating reagents include phosphoryl chloride and peptide coupling reagents. Lysergic acid is made by alkaline hydrolysis of lysergamides like ergotamine, a substance derived from the ergot fungus on rye, or from ergine (lysergic acid amide, LSA), a compound that is found in morning glory (Ipomoea tricolor) and Hawaiian baby woodrose (Argyreia nervosa) seeds. LSD is a chiral compound with two stereocenters at the carbon atoms C-5 and C-8, so that theoretically four different optical isomers of LSD could exist. 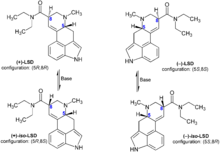 LSD, also called (+)-D-LSD, has the absolute configuration (5R,8R). The C-5 isomers of lysergamides do not exist in nature and are not formed during the synthesis from D-lysergic acid. Retrosynthetically, the C-5 stereocenter could be analysed as having the same configuration of the alpha carbon of the naturally occurring amino acid L-tryptophan, the precursor to all biosynthetic ergoline compounds. However, LSD and iso-LSD, the two C-8 isomers, rapidly interconvert in the presence of bases, as the alpha proton is acidic and can be deprotonated and reprotonated. Non-psychoactive iso-LSD which has formed during the synthesis can be separated by chromatography and can be isomerized to LSD. A totally pure salt of LSD will emit small flashes of white light when shaken in the dark. LSD is strongly fluorescent and will glow bluish-white under UV light. The four possible stereoisomers of LSD. Only (+)-LSD is psychoactive. "LSD," writes the chemist Alexander Shulgin, "is an unusually fragile molecule." It is stable for indefinite time if stored as a solid salt or dissolved in water, at low temperature and protected from air and light exposure. LSD has two labile protons at the tertiary stereogenic C5 and C8 positions, rendering these centres prone to epimerisation. The C8 proton is more labile due to the electron-withdrawing carboxamide attachment, but removal of the chiral proton at the C5 position (which was once also an alpha proton of the parent molecule tryptophan) is assisted by the inductively-withdrawing nitrogen and pi electron delocalisation with the indole ring. LSD also has enamine-type reactivity because of the electron-donating effects of the indole ring. Because of this, chlorine destroys LSD molecules on contact; even though chlorinated tap water contains only a slight amount of chlorine, the small quantity of compound typical to an LSD solution will likely be eliminated when dissolved in tap water. The double bond between the 8-position and the aromatic ring, being conjugated with the indole ring, is susceptible to nucleophilic attacks by water or alcohol, especially in the presence of light. LSD often converts to "lumi-LSD", which is totally inactive in human beings (to the best of current knowledge). A controlled study was undertaken to determine the stability of LSD in pooled urine samples. The concentrations of LSD in urine samples were followed over time at various temperatures, in different types of storage containers, at various exposures to different wavelengths of light, and at varying pH values. These studies demonstrated no significant loss in LSD concentration at 25°C for up to four weeks. After four weeks of incubation, a 30% loss in LSD concentration at 37°C and up to a 40% at 45°C were observed. Urine fortified with LSD and stored in amber glass or nontransparent polyethylene containers showed no change in concentration under any light conditions. Stability of LSD in transparent containers under light was dependent on the distance between the light source and the samples, the wavelength of light, exposure time, and the intensity of light. After prolonged exposure to heat in alkaline pH conditions, 10 to 15% of the parent LSD epimerized to iso-LSD. Under acidic conditions, less than 5% of the LSD was converted to iso-LSD. It was also demonstrated that trace amounts of metal ions in buffer or urine could catalyze the decomposition of LSD and that this process can be avoided by the addition of EDTA. A single dose of LSD may be between 100 and 500 micrograms - an amount roughly equal to one-tenth the mass of a grain of sand. Threshold effects can be felt with as little as 25 micrograms of LSD. Dosages of LSD are measured in micrograms (mg), or millionths of a gram. By comparison, dosages of most drugs, both recreational and medicinal, are measured in milligrams (mg), or thousandths of a gram. For example, an active dose of mescaline, roughly 0.2 to 0.5g, has effects comparable to 100 mg or less of LSD. Typical doses in the 1960s ranged from 200 to 1000 mg while street samples of the 1970s contained 30 to 300 mg. By the 1980s, the amount had reduced to between 100 and 125 mg, lowering more in the 1990s to the 20-80 mg range, and even more in the 2000s. Estimates for the median lethal dose (LD50) of LSD range from 200 mg/kg to more than 1 mg/kg of human body mass, though most sources report that there are no known human cases of such an overdose. Other sources note one report of a suspected fatal overdose of LSD occurring in November 1975 in Kentucky in which there were indications that ~1/3 of a gram (320 mg or 320,000 ng) had been injected intravenously. (This is a very extraordinary amount, equivalent to over 3,000 times the average LSD dosage of ~100 mg). Experiments with LSD have also been done on animals; in 1962, an elephant named Tusko died shortly after being injected with 297 mg, but whether the LSD was the cause of his death is controversial (due, in part, to a plethora of other chemical substances administered simultaneously). LSD's effects normally last from 6-12 hours depending on dosage, tolerance, body weight and age. The Sandoz prospectus for "Delysid" warned: "intermittent disturbances of affect may occasionally persist for several days." Contrary to early reports and common belief, LSD effects do not last longer than the amount of time significant levels of the drug are present in the blood. Aghajanian and Bing (1964) found LSD had an elimination half-life of only 175 minutes. However, using more accurate techniques, Papac and Foltz (1990) reported that 1 mg/kg oral LSD given to a single male volunteer had an apparent plasma half-life of 5.1 hours, with a peak plasma concentration of 5 ng/mL at 3 hours post-dose. LSD may be quantified in urine as part of a drug abuse testing program, in plasma or serum to confirm a diagnosis of poisoning in hospitalized victims or in whole blood to assist in a forensic investigation of a traffic or other criminal violation or a case of sudden death. Both the parent drug and its major metabolite are unstable in biofluids when exposed to light, heat or alkaline conditions and therefore specimens are protected from light, stored at the lowest possible temperature and analyzed quickly to minimize losses. LSD affects a large number of the G protein coupled receptors, including all dopamine receptor subtypes, and all adrenoreceptor subtypes, as well as many others. LSD binds to most serotonin receptor subtypes except for 5-HT3 and 5-HT4. However, most of these receptors are affected at too low affinity to be sufficiently activated by the brain concentration of approximately 10-20 nM. In humans, recreational doses of LSD can affect 5-HT1A, 5-HT2A, 5-HT2C, 5-HT5A, and 5-HT6 receptors. 5-HT5B receptors, which are not present in humans, also have a high affinity for LSD. The psychedelic effects of LSD are attributed to its strong partial agonist effects at 5-HT2A receptors as specific 5-HT2A agonists are psychedelics and largely 5-HT2A specific antagonists block the psychedelic activity of LSD. Exactly how this produces the drug's effects is unknown, but it is thought that it works by increasing glutamate release in the cerebral cortex and therefore excitation in this area, specifically in layers IV and V. LSD, like many other drugs, has been shown to activate DARPP-32-related pathways. LSD was first synthesized on November 16, 1938 by Swiss chemist Albert Hofmann at the Sandoz Laboratories in Basel, Switzerland as part of a large research program searching for medically useful ergot alkaloid derivatives. LSD's psychedelic properties were discovered 5 years later when Hofmann himself accidentally ingested an unknown quantity of the chemical. The first intentional ingestion of LSD occurred on April 19, 1943, when Hofmann ingested 250 mg of LSD. He said, this would be a threshold dose based on the dosages of other ergot alkaloids. Hofmann found the effects to be much stronger than he anticipated. 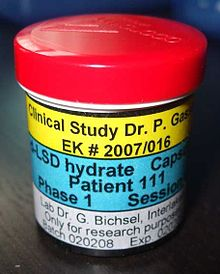 Sandoz Laboratories introduced LSD as a psychiatric drug in 1947. Beginning in the 1950s the US Central Intelligence Agency began a research program code named Project MKULTRA. Experiments included administering LSD to CIA employees, military personnel, doctors, other government agents, prostitutes, mentally ill patients, and members of the general public in order to study their reactions, usually without the subject's knowledge. The project was revealed in the US congressional Rockefeller Commission report in 1975. In 1963 the Sandoz patents expired on LSD. Also in 1963, the US Food and Drug Administration classified LSD as an Investigational New Drug, which meant new restrictions on medical and scientific use. Several figures, including Aldous Huxley, Timothy Leary, and Al Hubbard, began to advocate the consumption of LSD. LSD became central to the counterculture of the 1960s. On October 24, 1968, possession of LSD was made illegal in the United States. The last FDA approved study of LSD in patients, ended in 1980, while a study in healthy volunteers was made in the late 1980s. Legally approved and regulated psychiatric use of LSD continued in Switzerland until 1993. Today, medical research is resuming around the world. Because an active dose of LSD is very minute, a large number of doses can be synthesized from a comparatively small amount of raw material. Beginning with ergotamine tartrate, for example, one can manufacture roughly one kilogram of pure, crystalline LSD from five kilograms of the ergotamine salt. Five kilograms of LSD (25 kilograms of ergotamine tartrate) could provide 100 million doses, according to the DEA, more than enough to meet what is believed to be the entire annual U.S. demand. Since the masses involved are so small, concealing and transporting illicit LSD is much easier than smuggling other illegal drugs like cocaine or cannabis. Manufacturing LSD requires laboratory equipment and experience in the field of organic chemistry. It takes two to three days to produce 30 to 100 grams of pure compound. It is believed that LSD is not usually produced in large quantities, but rather in a series of small batches. 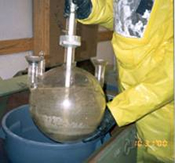 This technique minimizes the loss of precursor chemicals in case a step does not work as expected. LSD is produced in crystalline form and then mixed with excipients or redissolved for production in ingestible forms. Liquid solution is either distributed in small vials or, more commonly, sprayed onto or soaked into a distribution medium. Historically, LSD solutions were first sold on sugar cubes, but practical considerations forced a change to tablet form. Appearing in 1968 as an orange tablet measuring about 6 mm across, "Orange Sunshine" acid was the first largely available form of LSD after its possession was made illegal. Tim Scully, a prominent chemist, made some of it, but said that most "Sunshine" in the USA came by way of Ronald Stark, who imported approximately thirty-five million doses from Europe. Over a period of time, tablet dimensions, weight, shape and concentration of LSD evolved from large (4.5-8.1 mm diameter), heavyweight (=150 mg), round, high concentration (90-350 mg/tab) dosage units to small (2.0-3.5 mm diameter) lightweight (as low as 4.7 mg/tab), variously shaped, lower concentration (12-85 mg/tab, average range 30-40 mg/tab) dosage units. LSD tablet shapes have included cylinders, cones, stars, spacecraft and heart shapes. The smallest tablets became known as "Microdots". 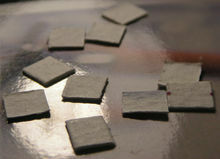 After tablets came "computer acid" or "blotter paper LSD", typically made by dipping a preprinted sheet of blotting paper into an LSD/water/alcohol solution. More than 200 types of LSD tablets have been encountered since 1969 and more than 350 blotter paper designs have been observed since 1975. About the same time as blotter paper LSD came "Windowpane" (AKA "Clearlight"), which contained LSD inside a thin gelatin square a quarter of an inch across. LSD has been sold under a wide variety of often short-lived and regionally restricted street names including Acid, Trips, Uncle Sid, Blotter, Lucy, Alice and doses, as well as names that reflect the designs on the sheets of blotter paper. Authorities have encountered the drug in other forms - including powder or crystal, and capsule. LSD manufacturers and traffickers in the United States can be categorized into two groups: A few large-scale producers, and an equally limited number of small, clandestine chemists, consisting of independent producers who, operating on a comparatively limited scale, can be found throughout the country As a group, independent producers are of less concern to the Drug Enforcement Administration than the larger groups, as their product reaches only local markets. 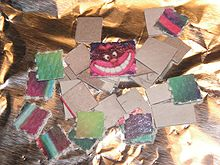 Since 2005, law enforcement in the United States and elsewhere has seized several chemicals and combinations of chemicals in blotter paper which were sold as LSD mimics, including DOB, 2C-I, DOC, a mixture of DOC and DOI, and a mixture of DOC and DOB. Street users of LSD are often under the impression that blotter paper which is actively hallucinogenic can only be LSD because that is the only chemical with low enough doses to fit on a small square of blotter paper. While it is true that LSD requires lower doses than most other hallucinogens, blotter paper is capable of absorbing a much larger amount of material. The DEA performed a chromatographic analysis of blotter paper containing 2C-C which showed that the paper contained a much greater concentration of the active chemical than typical LSD doses, although the exact quantity was not determined. 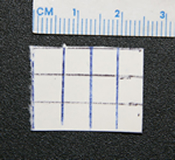 Blotter LSD mimics can have relatively small dose squares; a sample of blotter paper containing DOC seized by Concord, California police had dose markings approximately 6 mm apart. The United Nations Convention on Psychotropic Substances (adopted in 1971) requires its parties to prohibit LSD. Hence, it is illegal in all parties to the convention, which includes the United States, Australia, New Zealand, and most of Europe. However, enforcement of extant laws varies from country to country. Medical and scientific research with LSD in humans is permitted under the 1971 UN Convention. In Canada, LSD is a controlled substance under Schedule III of the Controlled Drugs and Substances Act. Every person who seeks to obtain the substance, without disclosing authorization to obtain such substances 30 days before obtaining another prescription from a practitioner, is guilty of an indictable offense and liable to imprisonment for a term not exceeding 3 years. Possession for purpose of trafficking is an indictable offense punishable by imprisonment for 10 years. In the United Kingdom, LSD is a class A drug. This means possession of the drug without a license is punishable with 7 years imprisonment and/or an unlimited fine, and trafficking is punishable with life imprisonment and an unlimited fine (see main article on drug punishments Misuse of Drugs Act 1971). In 2000, after consultation with members of the Royal College of Psychiatrists' Faculty of Substance Misuse, the UK Police Foundation issued the Runciman Report which recommended "the transfer of LSD from Class A to Class B". In November 2009, the UK Transform Drug Policy Foundation released in the House of Commons a guidebooks to the legal regulation of drugs, After the War on Drugs: Blueprint for Regulation, which details options for regulated distribution and sale of LSD and other psychedelics. LSD is Schedule I in the United States, according to the Controlled Substances Act of 1970. This means LSD is illegal to manufacture, buy, possess, process, or distribute without a DEA license. By classifying LSD as a Schedule I substance, the Drug Enforcement Administration holds that LSD meets the following three criteria: it is deemed to have a high potential for abuse; it has no legitimate medical use in treatment; and there is a lack of accepted safety for its use under medical supervision. There are no documented deaths from chemical toxicity; most LSD deaths are a result of behavioral toxicity. There can also be substantial discrepancies between the amount of chemical LSD that one possesses and the amount of possession with which one can be charged in the U.S. This is because LSD is almost always present in a medium (e.g. blotter or neutral liquid), and the amount that can be considered with respect to sentencing is the total mass of the drug and its medium. This discrepancy was the subject of 1995 United States Supreme Court case, Neal v. U.S.
Lysergic acid and lysergic acid amide, LSD precursors, are both classified in Schedule III of the Controlled Substances Act. Ergotamine tartrate, a precursor to lysergic acid, is regulated under the Chemical Diversion and Trafficking Act. Some notable individuals have commented publicly on their experiences with LSD. Some of these comments date from the era when it was legally available in the US and Europe for non-medical uses, and others pertain to psychiatric treatment in the 1950s and '60s. Still others describe experiences with illegal LSD, obtained for philosophic, artistic, therapeutic, spiritual, or recreational purposes. Steve Jobs, co-founder and CEO of Apple Inc. said, "Taking LSD was a profound experience, one of the most important things in my life." Kary Mullis is reported to credit LSD with helping him develop DNA amplification technology. Aldous Huxley, author of Brave New World became a user of psychedelics after moving to Hollywood, CA. He was at the forefront of the countercultures experimentation with psychedelic drugs, which led to his 1954 work The Doors of Perception. Dying of cancer, on November 22, 1963, he asked his wife to inject him with 100ug of LSD. He died from the cancer later that day.